Despite his recent success, the story of Alex Neil is as unconventional as it is fascinating. A playing career with clubs chasing the big time in factor of external success and different factors of Football remarkably in the millennium period meant that stability was not a value that contradicted with Neil’s earlier playing experiences. As a teenager in an Airdrieonians side at the brink of the millennium, it was the external circumstances occurring in Scottish soccer during this period in following the promise of television money and spearheaded by promising foreign dominance that presided his original club to go bust within two years of his debut. Neil’s style and influence however did not go unnoticed as he scored five goals in sixteen appearances for the club, impressive for a newcomer. Neil’s stay would be brief though as liquidators KPMG had taken over the running of the club and thus the tiny midfielder was sold to English Division 1 club Barnsley for a mere £16,000, enough to impress Dave Bassett, an English soccer legend. The move was deserved and yet considered rare because English clubs were no longer purchasing Scottish players because a conveyor talent belt had been stopped. Neil could not have predicted that he had swapped one club facing abyss for another that would be engulfed in their post Premiership horizon by the collapse of ITV Digital. Barnsley had narrowly missed out on a Premier League place by virtue of a play-off defeat against Ipswich, how ironic this would be the club he defeated in his play-off game 15 years later. The lure of First Division football however was an attractive proposition as he immediately made an impact slotting, comfortably into a team that included the likes of Kevin Gallen, Stuart Ripley and Neil Shipperley. Neil would become a regular for the following two seasons. Alas the club would not make it to the Premier League but rather the Second Division as the ITV Digital destruction button hit. His final game of the 01-02 season resulting in Barnsley’s relegation ironically was against Norwich, the team for whom he would manage in the future. A 2-0 home defeat occurred resulting in the Terriers losing their grip on the cylinder. For a young man not yet celebrating his 21st Birthday, this is something he vowed one day that he would get back to this level. 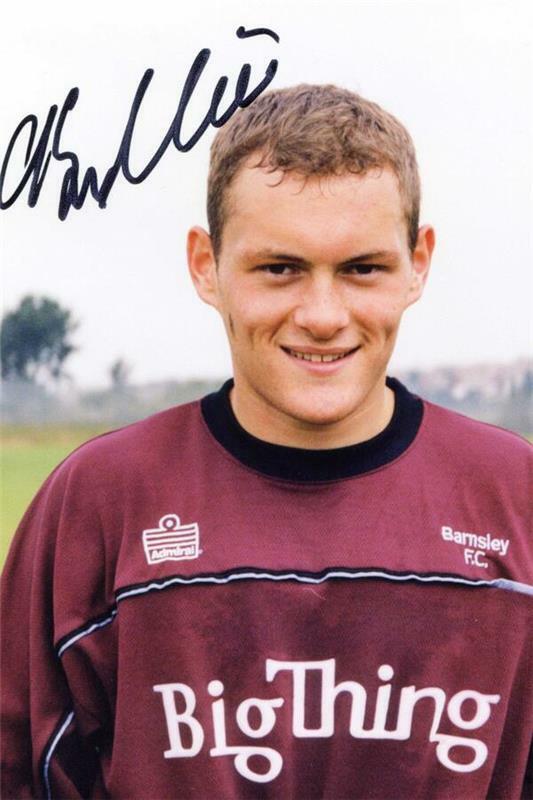 Barnsley officially entered administration in November 2002 as the young Neil became one of the key figures in their English Second Division campaign as crowds dwindled and dark nights prevailed. Before his four-year stay at Oakwell would come to an end, he would help future Premier League figures such as Jonathan Walters and Garry Monk, both on loan from the top flight in their developments. Despite being near enough their ages, the result was over ten years later seeing Walters established as a fully recognised international striker and Monk, a young promising manager of top foreign players at Swansea. Neil was released and it was a spell at Mansfield Town where he would gain a taste for the captaincy for the first time but when Carlton Palmer, a former England international, showed him the door, you could have forgiven this boy a taste of sour grapes. In 2005, Neil who had been hoping for a shot at Premier League glory was back to Scotland at 24. It was at this point that focus and self-growth was evident. Looking for long-term stability, Neil returned home to Lanarkshire signing with Hamilton Academical. This was a club too who had been exceptionally close to administration. But they were rebuilding and had a chairman who loved the club enough to want to produce a crop of exceptional new young players. Neil would also soon become captain of the club for a decade. The result saw James McCarthy and James McArthur rise through with Neil to become widely lauded talents. It was clear that there was a long-term goal in place through captain, manager and player towards an objective. Neil’s early days of seeing clubs to the wall was in contrast to this where there was a real emotional aspect at heart. Promotion finally came where he captained the club to the SPL in 2008. Hamilton’s need to keep producing young players who would also continue after both McCarthy, McArthur and another, Brian Easton were sold. Neil’s appearances were limited too as he made just 34 appearances in two seasons in the top-flight as injury curtailed his time. Neil’s last season as a player only in 2012-2013 would result in three red cards, a rare note to a man despite being known for his aggressive style. The club were rebuilding as future West Ham bound, Stephen Hendrie, young attacking talisman, Alistair Crawford and on loan future Scotland striker, Stevie May were pitted into the square line. Hamilton narrowly failed to secure promotion but Reid had departed by April, thus giving Neil what can now be described as the holy grail ride to the English Premier League. With a decade of long-term stability behind him and blessed with the earlier attributes that had seen his potential, Neil decided to utilise scouts in search for productive players as a manager. The results included Tony Andreu, and unorthodox veterans such as Jason Scotland and Mikeal Antoine-Curier. A crop of young players however fashionable like Louis Longridge and Darren Mackinnon would help make up the chase as Accies appeared to go from being a drop in for lower-league English journeymen at least on a first team note to a quantity of home breeding youngsters. By May 2014, they had secured a play-off position. This was Neil’s big chance. Cue a 2-0 win at Easter Road and a win on penalties in front of a live television audience with Neil becoming a hero finally taking the club back at his first time of asking. Neil’s discipline was gripe in the top-flight as the club secured a 1-0 victory at Celtic. Talk came of Accies possibly having a stint at Europe as they were near top of the league. The manager was forthright in his ambitions to attack at all costs, the earlier part of his career coming at not learning to take anything for granted. It was the 5-0 win against Lanarkshire rivals, Motherwell that saw Neil attract the proposition of Norwich City, a club he had faced 13 years earlier as a player. These were players on £30,000 a week but like Barnsley, they too had been eschwed from the glory of Premier League soccer in recent years. Why would he be unfazed after all the challenges? Youth was still on his side and he accepted the job making the move to Carrow Road at 33. Being the king of play-offs must be a feat. Here he was winning the play-off in the First Division. His former teams Barnsley and Airdrie had been so close to success in this case. Here he was doing it himself.